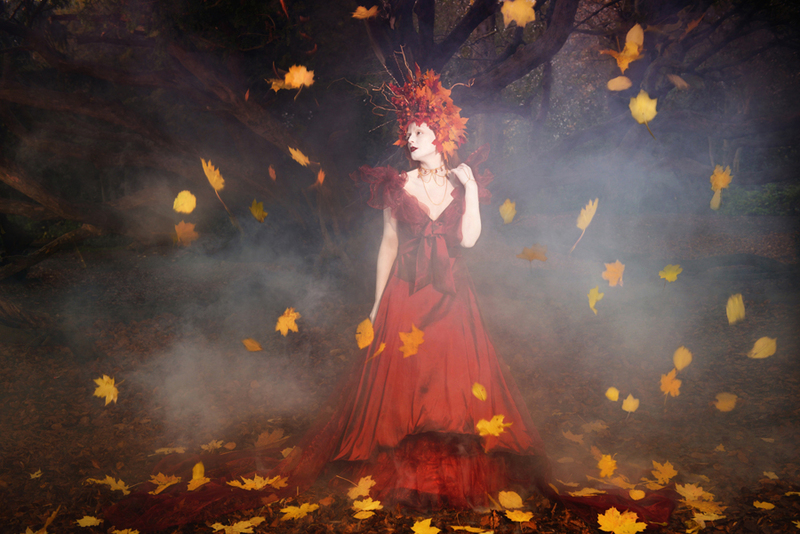 The origin of the Autumn Queen concept came initially from literally a walk in the park whilst undertaking a recce for another shoot. A scene which was truly inspiring and actually felt quite magical with a tree which looked like it came straight from a fairytale which gave the appearance of being upside down with the roots as branches, the ground bright red in the late Autumn sunshine with a carpet of red leaves and overhanging branches from other trees seemed to frame the scene. 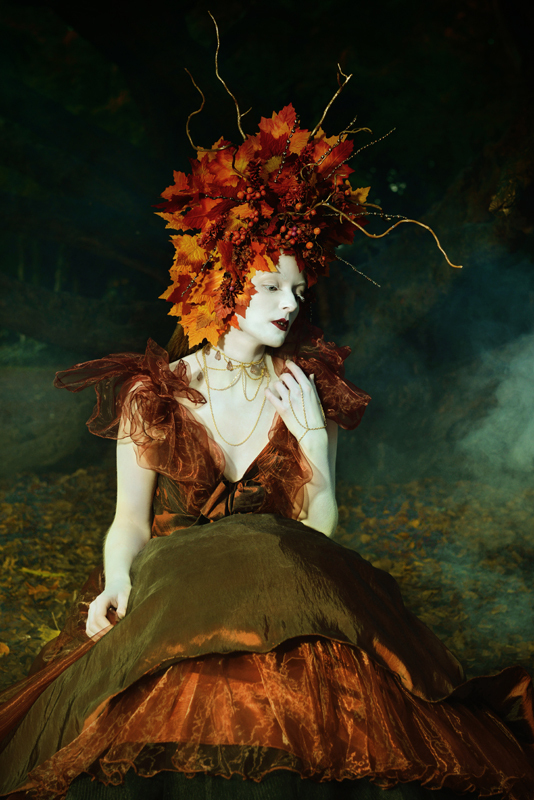 The desired atmosphere of the shoot was to be quite surreal, that feeling would be evoked through colour and tone of image, mood smoke, and an almost ethereal quality to the model’s pure white skin, eyelashes and brows. 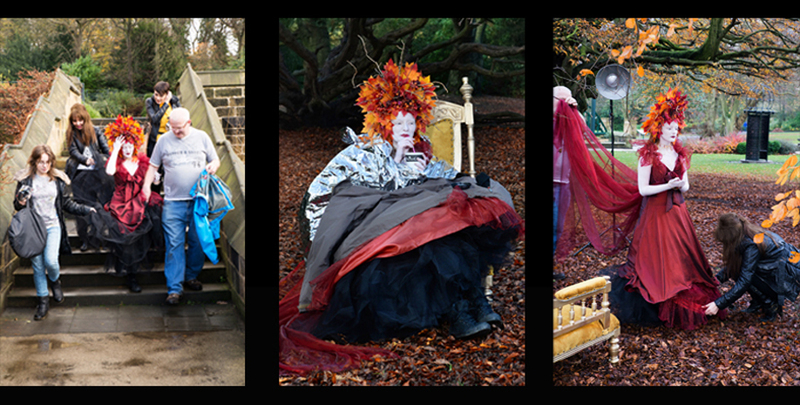 As much as the actual photography is creatively fulfilling the hands-on creation of the concept is equally rewarding including designing and making the headdress, remodelling the gown and reupholstering the throne were all aspects that gave great satisfaction. 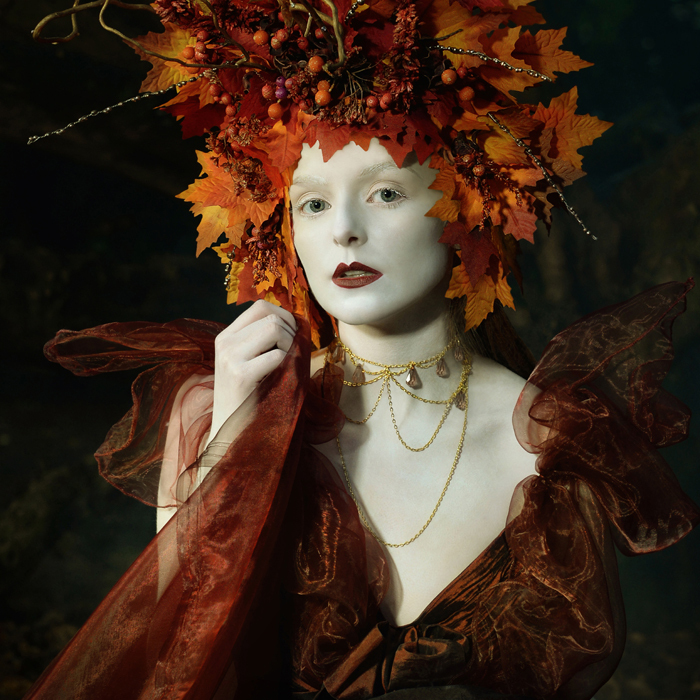 The headdress was an integral part of the overall images so it was important that the final feel was truly Autumnal yet a little surreal. 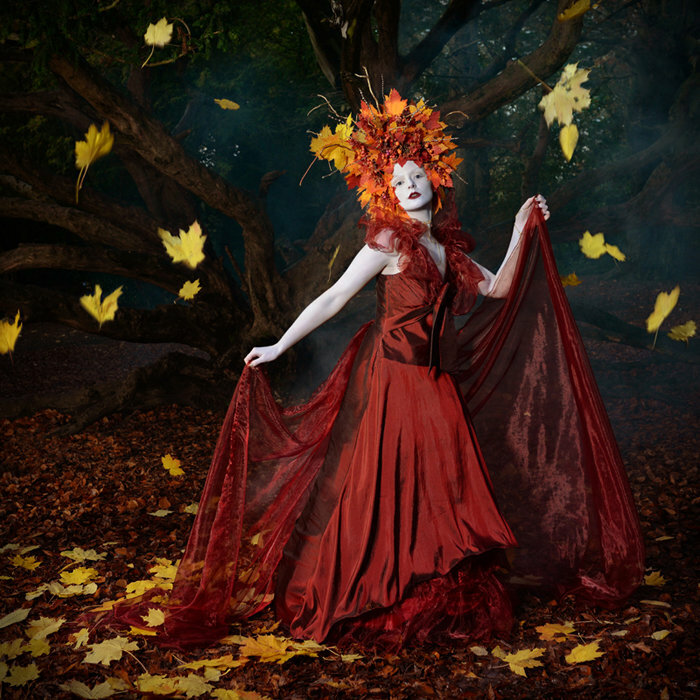 As with all the shoots a great deal of development and planning is required and this shoot was certainly no exception. 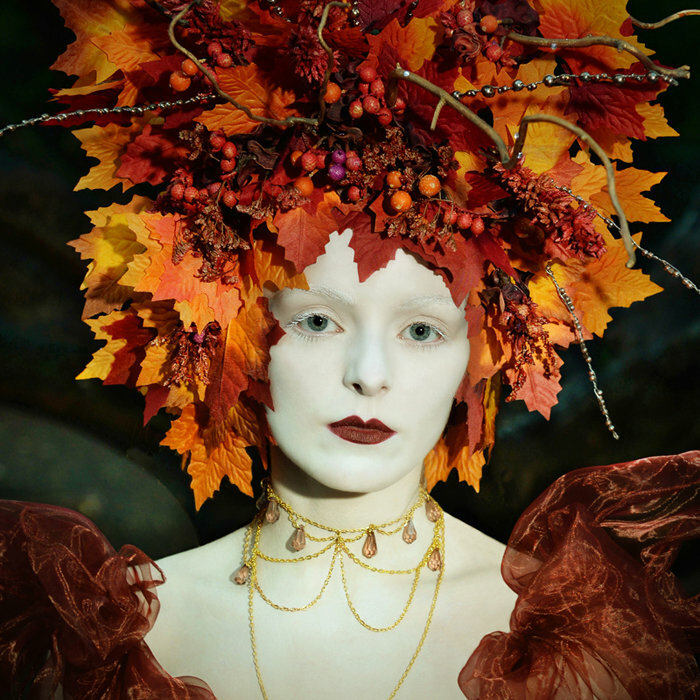 The actual timing of the shoot was key as the leaves had to form the red carpet beneath the trees as is depicted in this image which was taken the previous Autumn. However as this Autumn was unseasonably warm the trees in this location were slower to change colour, because of this delay it was a day by day check constantly updating local weather forecasts until the optimum day was decided. Unfortunately the day before the shoot the weather changed dramatically with strong winds and pouring rain and although not deterred the scene which we encountered was not the beautiful red carpet previously seen. The strong winds had blown the leaves from under the trees, so all the soaking wet leaves were retrieved and replaced to the original spot; this was achieved with snow shovels, tarpaulin and a lot of commitment from the team. Once the amazing face and body makeup was completed by Emily Branthwaite (Emily Jane MUA ) our beautiful model Kayleigh ( Kayleigh Falcus Modelling ) was ready to face the cold weather. Kayleigh who is multi talented is also a Jewellery designer ( Kayleigh Falcus Jewellery ) had designed a beautiful piece especially for the shoot which was perfect for the concept, so a huge thank you to Kayleigh. 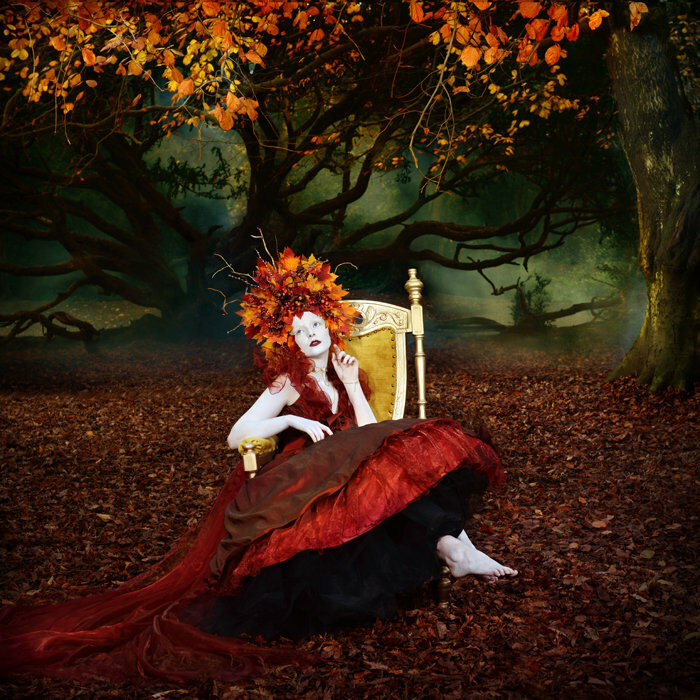 The poor Autumn Queen wrapped in emergency foil blankets and sipping hot drinks through a straw to try to keep warm whilst sitting on her throne. 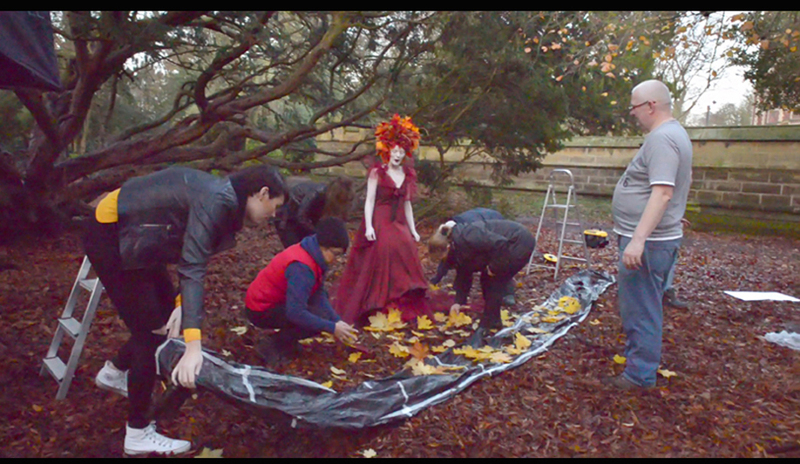 As with other shoots the objective is to capture as much as possible from the scene in camera and as falling leaves was an integral element for the Autumn Queen shoot a ‘leaf falling contraption’ was needed in order to have some control over the leaves as they fell. A contraption was indeed devised and actually worked remarkably well considering it was made from garbage bags, masking tape and a few metres of rope, it is amazing how low tech solutions are sometimes so successful. It was a great shoot albeit shorter than planned but a big thank you to our brilliant team who worked tirelessly.... which consisted of Morgan Stephenson, Harinder Kaur, Mary Naughton, Lesley Huges, Nicola Kitching, Marie Kitching, Kayleigh Falcus (Model) and Emily Jane (MUA). Plus thanks also to Gateshead Council for kind permission to shoot and Doug Clayton head of Security and his team for facilitating all our needs. A huge thank you to everyone for making it such a fun, creative but productive day !